Just by looking at the picture you can tell what the main problem was with these zucchini fries, right? If you said, "They absolutely REFUSED TO GET CRISPY," you'd be exactly right. That was my main issue with them. The flavor was great (with a few modifications -- without my changes, I think these would have been on the bland side), the zucchini was nice and tender, but the breading just wasn't nearly crispy enough for my liking. Joe didn't even try them, just because they didn't look appealing to him. I probably wouldn't be posting this recipe if it wasn't for the tomato coulis sauce that accompanied the zucchini fries. It was really, really good, and totally made suffering through the non-crispy fries worth it. Although the peeling and coring of the tomatoes is a little bit more time-consuming than just popping the lid off a can of diced tomatoes, I definitely recommend using fresh ones for this. The flavor of fresh tomatoes is just so much sweeter and, well, fresher than canned. I loved the way the honey, vinegar, onion and basil all worked so well together. I'll be making this sauce frequently and will probably be putting it on just about anything I can think of. 3. In a medium bowl, combine the bread crumbs, garlic powder, salt, and pepper. Place the flour in another medium bowl and the beaten eggs in a smaller bowl. 4. 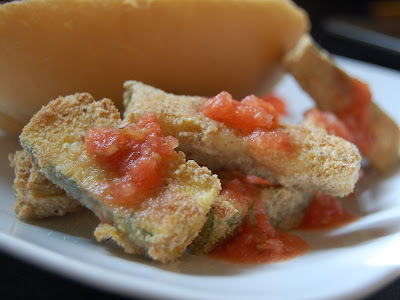 Dip the zucchini sticks first in the flour until lightly coated, then in the beaten eggs. Roll them in the bread crumb mixture until well covered. 5. Transfer the zucchini pieces to a nonstick baking sheet. Drizzle with olive or vegetable oil and toss gently to combine. Bake until the zucchini is tender but the coating is crisp, about 20 minutes. Salt immediately after removing from oven. Let the fries cool slightly before eating. Serve with the coulis as a dipping sauce. This looks good. I am not sick of zucchini yet although I have a feeling, in another month, I will be. We have been eating it, in every which way. This is a new recipe for me and I want to try it. I love your choice of recipes.